According to statistics, pavement ants are considered to be one of the most common ant species within the United States. Despite their existence in such vast numbers, most do not consider pavement ants to be a nuisance; unless, of course, you find yourself struggling with the insects on an afternoon picnic. These types of ants commonly burrow in common locations where pavement exists. Examples include sidewalks, the slabs of buildings, and driveways. If you have ever observed a small dirt mound on top of paved areas or near to areas where pavement is necessary, you have observed the workings of pavement ants. In this brief guide, you will learn a few basic facts about pavement ants and will be provided with some information that will aid in the elimination of these insects. If you have ants and suspect that they may be pavement ants, it is important to learn about the distinguishing characteristics of these insects. In doing so, you will be able to determine the best pest control measures that must be taken to eliminate the population from your property. 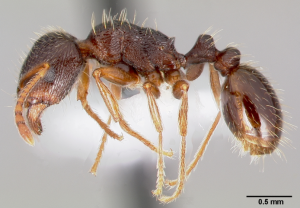 This type of ant may be anywhere from 1/8of an inch to 1/16 of an inch in length. In most instances, the body is brown or black and the legs and the antennae are considered to be pale, in comparison. It is common to see a pair of spines on the back region of the insect and distinguishable grooves located on the thorax and the head. The swarmers and the queens are the reproducing ants in the colony. These are twice as big as the workers of the colony. Additionally, these ants have wings and the workers do not have wings. Pavements ants are quite persistent when it comes to seeking food. In fact, these insects will often invade buildings just to obtain access to food. Surprisingly, these types of ants are not at all selective when it comes to the foods that they elect to consume. It is common to observe these insects consuming the juices from fruits, seeds, nectar, and other types of insects. Additionally, any type of household food will prove to be very appealing to pavement ants. These include – but, are not at all limited to – cheese, grease, meats, breads, and even dairy products, such as ice cream. If a large population of pavement ants infest a home and work towards certain areas – such as the kitchen – they have the potential to become a nuisance.